If I offered a guest a glass of sherry, he or she would probably be surprised. For sherry is not exactly a popular tipple in New Zealand and certainly not by the younger generation. Many of the bottles that are on sale in the supermarkets and chain liquor stores can be likened to 'cheap plonk' as a 2 litre flagon of, say, The Old Masters Sherry, costs as little as NZ$16.00. The Old Masters is a NZ-made sherry, made from the Palomino - the traditional sherry grape - which has been grown and vinted in the same way as a still white wine. It's after the wine is made that it is fortified with grape spirit to a dry, medium or a sweet (labelled 'cream') level. I usually have a bottle of sherry in my cupboard, but it is for cooking not for drinking. And I was one of those who would screw my nose up if offered a glass. That is until recently, when I was introduced to real sherry - sherry from Spain made by one of the great masters, Emilio Lustau. The occasion was the visit of Rob Hull, a Lustau representative from Europvin, their export office in Bordeaux. And who better to co-host the tasting than Spanish wine expert José Fernandez, the manager of the Auckland branch of the NZ agent, Eurowine. Rob Hull gave us a talk on the background and styles of Lustau Sherries. The company's headquarters are in Jerez (pronounced Herreth), the heart of the 'Sherry Triangle' in the southwest of Spain. Here the Palomino Fino grape excels on gentle undulating chalk-rich slopes that face the Atlantic Ocean, while Pedro Ximénez and Moscatel grapes, which produce a sweeter style of wine, are grown on the chalk-poor soils elsewhere in the region. In the Sherry Triangle, a phenomenon occurs - it is the spontaneous growth a unique yeast called 'Flor del Vino, which gives these wines their unique flavour. The three main styles of sherries made from the Palomino Fino grape are the light coloured lower alcohol Fino, the amber coloured higher alcohol Amontillado and the golden, high alcohol Oloroso wines. The first wines we tried were the Fino styles and were accompanied with egg-rich Spanish Tortilla. "Fino Sherries are popular summer wines in Spain", we are told. The alcohol content is little more than that of an alcoholic chardonnay. They are best served chilled and drunk within 2 to 3 days of opening. "There's often an aroma of sea breeze or a salty tang and a green almond nuttiness," says our host, Rob Hull, of this pale coloured wine. But the salty aromas I find are more like that of salty beef tea made from stock cubes. And it's strong. Oh well, let's take a sip. In the palate the wine is very dry, with light, nutty, beefy, salty flavours. The finish is lifted and hot and nuttiness lingers. An interesting introduction to the world of these wines. This is more like it, with a delicate and less overt aroma hinting of nuts. It's a rounder, weightier wine in the palate and a touch oakier. I like the nut and raisin flavours with the touch of aldehydic yeastiness. "This is the perfect accompaniment for almonds and olives", say Rob. Mmmm, I could drink this wine. The Fino wines are salty and I can imagine them being quite refreshing on very hot days and with their suitability to nuts and olives they are the perfect aperitif and well as the ideal accompaniment to tapas. Next we tried a couple of Amontillado's. They are generally bright amber in colour, dry with crisp acidity and with nutty, dried fruit characters. We had some tapas to accompany the wine and these two were accompanied with rolled, breaded pork infused with Spanish spices. Bronze amber colour and raisin aroma. Lovely and round in the palate with honey, nuts and raisins carrying through and lingering on the finish along with spreading warmth from the alcohol. I though this quite an elegant wine which was dry and well balanced. Later, at home, I tried some of this wine with almonds I had fried in hot salty oil. This was just the most delicious combination and totally moreish. The saltiness of the wine was not apparent at the tasting but after a couple of glasses at home, the salty flavour lingered for hours. I'm getting to like these wines. At the tasting I liked this even better than the Escuadrilla. Attractive aroma and rich flavours in the palate. Rounded and concentrated with figs, raisins, dried fruits and hazelnuts, with a lingering finish of salty nuts. This wine seems to have a higher acidity level. This wine is a good food proposition as the higher acidity cuts through oil and spices, making it the perfect accompaniment for many dishes. The third flight of wines included the Palo Cortado, which is a style between Amontillado and Oloroso, plus two of Oloroso. These were accompanied with Spicy Chicken nibbles and crumbed mussels (I did not try the mussels). A hint of beef tea aromas at first, but there's also some honey and later the nutty scents leap out of the glass. The wine is spicy and hot and the acid is abundant, while the sensation in the palate is warm and rounded. A hint of salt? No, Round, mellow aromas and in the palate dry and raisiny with dried fruits too and perhaps orange peel. A rich nutty finish. This is very good with the chicken. The Spanish spices are enhanced and the wine is long and mellow. This is a deeper coloured wine and is very rounded and smooth in the palate. Immediately, the sweeter richness is apparent although the wine is still predominantly dry. It is warm in the palate and the texture is viscous. Perfectly balanced in every way and flavours of dried fruits, figs and creamy nuts linger on the finish. My favourite wine of the tasting. The Amontillado's and Oloroso's are like comfort wines, we are told by José Fernandez. They are great in winter and are good with soups and stews. Now we moved into the sweet wines. "We drink these any time", says José with a grin. This is a style that was popular in the 19th century with the British colonists in India. By the time the sherry had been shipped to India it was quite mellowed with a burnt sugar edge to the flavour. These days it is made from 2/3 Oloroso and 1/3 Pedro Ximénez aged for 9 years then put back into barrel. It is placed in the hottest part of the winery and water is sprayed daily onto the floor to produce the humidity. Unlike the wine made from 100% Palomino Fino, this wine can be opened and held for several weeks. The sample was a deep, thick, coffee coloured wine. Rich raisin scents with just the faintest hint of beef tea. A clean style and not as viscous as I would have imagined. It has all the nutty, dried fruit characters of the Oloroso wine but mocha and caramel too. A rich, powerful wine and I can see why it was so popular. Lustau Moscatel Superior Solera Reserva 'Emilin' (NZ$38.95) was the finale and what a wine to finish with! It is made from pure muscat grapes and with 195grams per litre of sugar and 17% alc. by volume. After harvest, the grapes are placed on grass mats to raisin up before making the wine. It is then fortified to 17% alcohol and aged in the Solera. It has rich, powerful muscat scent with an attractive citrus, orange peel lift. It is thick and gorgeously viscous with a hot spiciness. Figs, dried prunes and orange peel are quite dominant on the finish. However, despite the sweetness it is very balanced and clean. A touch of caramel toffee lingers in the back of the palate. What a wonderful tasting and insight into these fabulous wines. Sherries are not just wines for aperitifs as I was once led to believe. They are wines for all courses and I look forward to creating a dinner to accompany several of these wines. 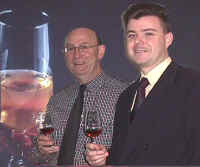 For more background on the company and the styles of wines see the Emilio Lustau web site.